A selection of garbage, collected. Makes 5-6 1lb jars of jam. Heat oven to GM2-3, 140C, 280F. Pop a saucer in the freezer. Pick over your fruit and discard any leafy/mouldy bits. No need to wash the fruit as the boiling will sterilise it. 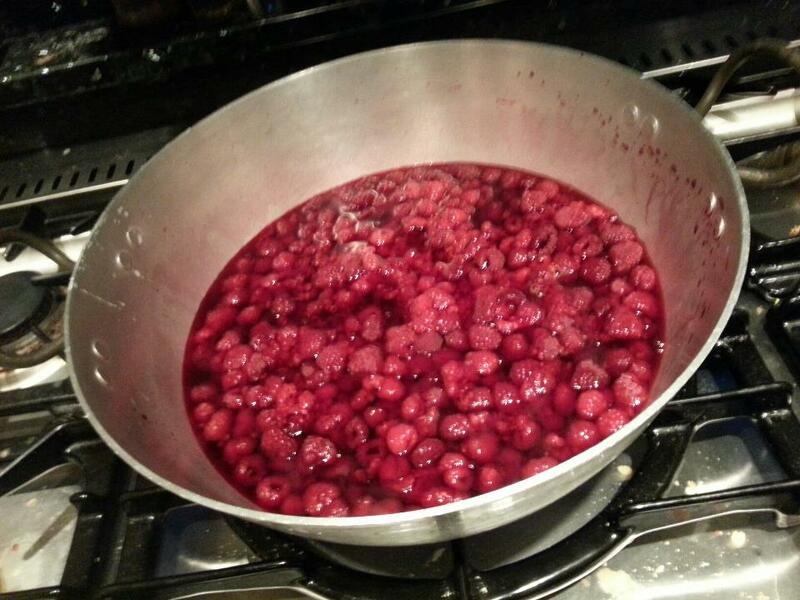 Put all fruit in a pan - ideally a jam pan with large bottom and plenty of surface area to help with boiling, but you can use a large normal saucepan if you don't have one. Bring the pan to a simmer, and cook fruit for half an hour on the lowest heat you can, and at the same time, put the sugar in a metal container, cover and put in the oven to warm up. Wash up your jam jars if you haven't already. After the fruit has cooked, take the sugar out of the oven and add to the fruit. While you're there, put the jam jars in the oven. Stir the fruit and sugar as gently as you can (to minimise the fruit break-up that will happen) until the sugar has all dissolved. Once dissolved, a wooden spoon covered in jam will have no sugar crystals on the back. Turn the heat up full and boil the jam for 5 minutes. Depending on your pan, you may need to scrape the bottom occasionally to stop the jam sticking. Take the saucer from the freezer and spoon a little bit of jam onto it - it should set quickly into a jam consistency. If it doesn't set, boil for another few minutes and repeat until it does. Take the jam off the heat, and allow it to settle for 5 minutes. Get your jam covers and wax discs ready - I use a few sheets of soaked kitchen towel for wetting the cellophane covers, and remember - wax side of the paper discs faces down, wet side of the covers faces up. Ladel the jam into the hot jam jars almost to the top (a jam funnel is really useful for doing this without mess), and cover immediately. Leave to cool. Enjoy your jam with fresh toasted crumpets, oven-warmed croissants, scones with clotted cream or just a bit of bread and butter. Bold the ones you have and use at least once a year, italicize the ones you have and don't use, strike through the ones you have had but got rid of, underline the ones you'd like. I wonder how many pasta machines, breadmakers, juicers, blenders, deep fat fryers, egg boilers, melon ballers, sandwich makers, pastry brushes, cheese boards, cheese knives, crepe makers, electric woks, salad spinners, griddle pans, jam funnels, pie funnels, meat thermometers, filleting knives, egg poachers, cake stands, garlic crushers, martini glasses, tea strainers, bamboo steamers, pizza stones,coffee grinders, milk frothers, piping bags, banana stands, fluted pastry wheels, tagine dishes, conical strainers, rice cookers, steam cookers, pressure cookers, slow cookers, spaetzle makers, cookie presses, gravy strainers, double boilers, sukiyaki stoves, ice cream makers, fondue sets, healthy-grills, home smokers, tempura sets, tortilla presses, electric whisks, cherry stoners, sugar thermometers, food processors, stand mixers, mincers, bacon presses, bacon slicers, mouli mills, cake testers, pestle-and-mortars, gratin dishes, apple corers, mango stoners and sets of kebab skewers languish dustily at the back of the nation's cupboards.